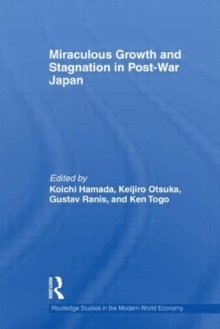 This volume examines different aspects of the Japanese experience in a comparative context. There is much here of relevance to contemporary developing countries anxious to initiate the experience of miraculous growth and anxious to avoid the subsequent stagnation. Such issues of the role of government in providing the right amount of infant industry protection, the relevance of the financial system, the country's peculiar corporate structure and the role of education in a comparative context serve to illuminate the lessons and legacies of this unique experience in development. The relationship between various dimensions of its domestic policy experience and Japan's international experience in trade promotion and foreign aid is explored and is of special interest to an international audience of academics and policymakers.